East Africa’s most cosmopolitan city Nairobi welcomes one of Hilton’s (NYSE: HLT) 14, DoubleTree by Hilton. 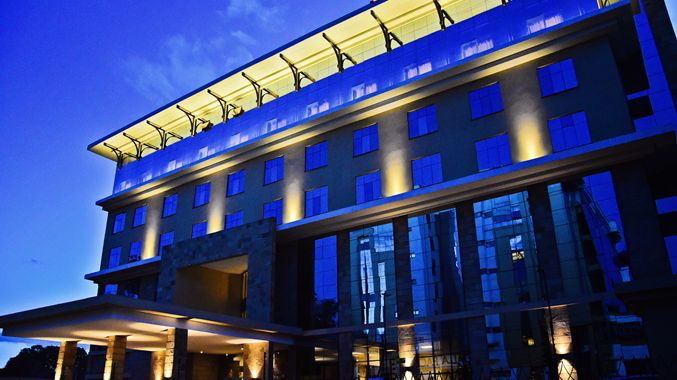 Located along Ngong Road, DoubleTree by Hilton Nairobi Hurlingham opens as the first DoubleTree branded property in Kenya – joining five DoubleTree by Hilton properties now open across Africa. Guests can start their day with a sumptuous breakfast in the exquisite Atrium Brasserie. For lunch and dinner, the hotel offers an a la carte menu and an extensive buffet, including Indian, Italian and pan-Asian cuisines. After a day exploring the city guests can unwind in the Piano Lounge with a selection of wines or contemporary cocktails, whilst enjoying sweet symphonies from live piano and saxophone players. Guests can rejuvenate with access to a 24-hour gymnasium, as well as a swimming pool open from 6am – 7pm. DoubleTree by Hilton Nairobi Hurlingham boasts five meeting rooms with natural daylight, capable of hosting up to 250 delegates. The hotel provides great space for corporate events and social gatherings with additional outdoor break out space on the terrace, which is perfect to enjoy Nairobi’s lovely weather. DoubleTree by Hilton Nairobi Hurlingham is the first hotel to open under Hilton’s Africa Growth Initiative. Hilton has committed a total of $50 million over the next five years towards the Hilton Africa Growth Initiative to support the continued expansion of its Sub-Saharan African portfolio. These funds are intended to support the conversion of around 100 hotels in multiple African markets into Hilton branded properties, providing instant benefits such access to over 69-million Hilton Honors members and leading innovative technology, including digital-check in. DoubleTree by Hilton Nairobi Hurlingham is part of the Hilton Honors, the award-winning guest-loyalty programme for Hilton’s distinct hotel brands. Hilton Honors members who book directly though preferred Hilton channels have access to instant benefits, including a flexible payment slider that allows members to choose nearly any combination of Points and money to book a stay, an exclusive member discount that can’t be found anywhere else and free standard Wi-Fi. DoubleTree by Hilton Nairobi Hurlingham is located at Ngong Lane, P.O. Box 69702 – 00400, Nairobi just 13 miles away from Jomo Kenyatta International Airport.